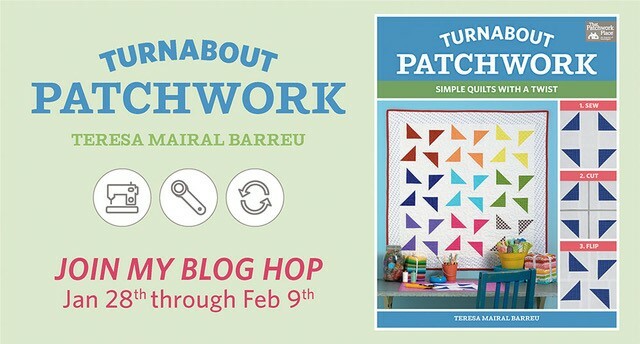 I have been following Teresa on Instagram for some time now, and was thrilled for her when she announced her first book “Turnabout Patchwork” was being published by Martingdale! It is a great book with lots of fun ways to make blocks then cut them and make something even more amazing! The tag line for the book is ‘Simple Quilts with a Twist’ 🙂 Keep on reading to find out how you could win a copy for yourself! The book is out now and would be well worth the purchase for a newish quilter wanting to extend themselves and do some fun new things with some simple blocks. Some of these quilts look amazing! 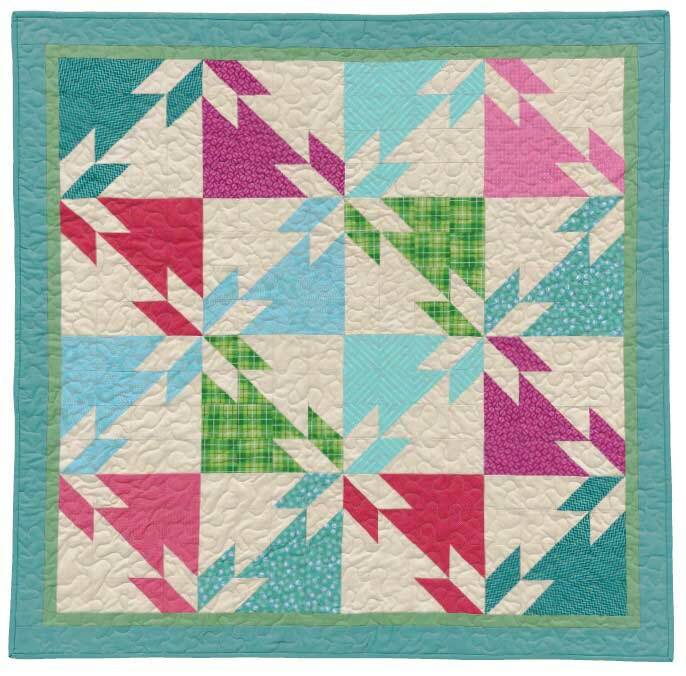 The block I chose was the Half Square Triangles and Squares block that gets a cool twist to end up with the Rose Garden Star Quilt! This year I am making a concerted effort to use my stash, so whilst this pattern called for yardage, the blocks are all less than 10″ square, so I popped out my April Showers layer cake (by Bonnie & Camille)! The cutting instructions said to trim to a little less than a 10″ square, but as the HSTs need to be trimmed again later I left my squares at the 10″ and then did all my trimming at once! Win, win! And I wanted to make a larger quilt than the pattern; the pattern calls for 16 blocks, however I made 30 blocks! Yep, they are fun and easy after the first few and I just powered through them! This made my quilt a good size for cuddling on the couch. And I chose this very curvy pattern to quilt on Lily the Longarm – I didn’t want to distract the eye too much from the rose garden star pattern, so an all over quilting design worked well. 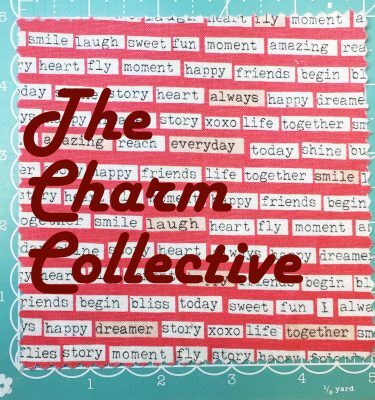 Teresa has generously offered a digital copy of her book to one of you to win! This is open internationally. Please comment below with which fabric you have hoarded away and are going to use this year! (please note that the comments are held in moderation so will not show up immediately but will show once I have authorised them!). I will select a winner on Tuesday the 5th February. THE COMPETITION IS NOW CLOSED – congratulations Cynthia Knapp! A digital version of the book will be heading your way soon! And head on over to Teresa’s blog for more information about her book. Here are all the other wonderful people who are making things from her book on this blog tour! 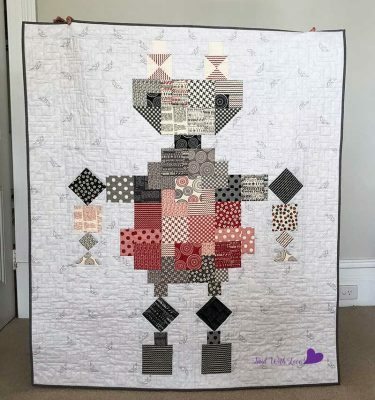 You did such a wonderful job – I am definitely adding this quilt to my must make list! I don’t have a big stash of material hoarded away but I’m working on it! I usually buy it as I need. That is about to change as I just bought a few lots of liberty while away. There might be a pattern in the book I could use the liberty for! Can’t wait to see what your plans are with your Liberty! Good luck! Ooh….. that sounds like it will be GREAT! I have a layer cake that has been sitting around for a while. This would be a great way to use it. Layer cakes can be so versatile! I loved that I could use up this one and now have this wonderful quilt! I have some b&c Miss Kate flannel that needs to be a snuggly winter quilt this year. I love how these designs are easy sew coupled with clever cutting, just what I need. ooooh…. that would look awesome! I love your quilt, and I know if Teresa designed it, it was easy to make too!! I have made a Hunter’s Star in a solid teal, but I’m really liking your color choices. I have a 30’s repo fabric that I think would look good made up with this pattern. Wow – so beautiful. I just dug through my stash and found a Benartex layer cake I picked up at Tuesday Morning awhile back. It might be called Transformation – bright colors and bold prints. It’s gonna be perfect! I love the fabric you used for this quilt. I have a collection of Civil war prints that would be great for this quilt. Thanks Karen! This pattern will look good in any high contrasting fabric/background! I have been wanting to make a quilt like this for some time. Thank you for the inspiration. I have been hoarding quite a bit of Kaffe Fassett material and plan to start a quilt this month with it. It is so good to use the hoarded fabrics! You have a wonderful quilt that is used and looked at way more often than it does sitting on a shelf 🙂 Have fun using up your Kaffe! I love this, and love the sizing up that you did. It looks nice in the book with the border, and your version looks great, too! Thanks Gretchen! I am not a big fan of borders (unless there is really no other way to make it the size you want!) so I just keep on making blocks to get it big enough!! Great quilt & perfect fabric choice. I have a stash of red, white & blue fabric for a quilt of valor that I will use this year. It will be my 4th QOV project. 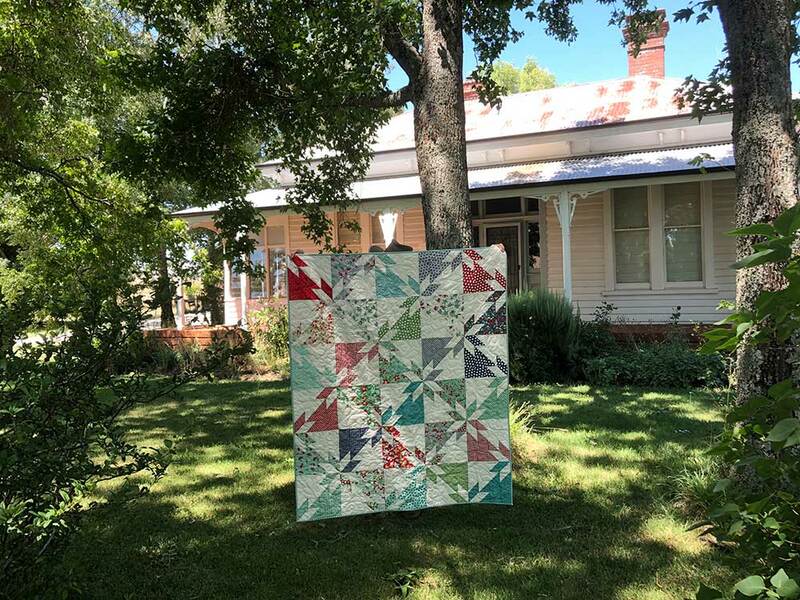 You did that pattern justice – beautiful quilt! Love your quilt! I have hoarded batiks and really want to use them this year. This would be perfect project. Thanks Teri – this pattern would look great in batiks with a great contrasting background! I have been collecting solid fabrics to make a quilt…this pattern would be perfect for them!!! Love your quilt! Wow–this looks like a great pattern that I’d love to try! I have a bunch of fat quarter bundles and layer cakes that I could use! Thanks Liz, yes it is a great pattern and fun to use with a layer cake! I have some Alison Glass fabrics “waiting” for just the right project. 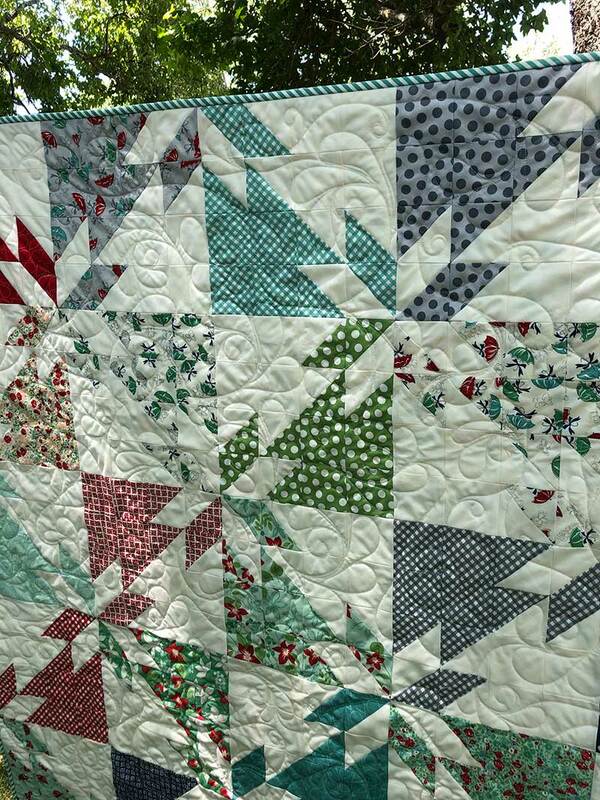 Do love the movement in this quilt design. Ahhhh….. Laura…. Alison Glass is one of my all time favourites! 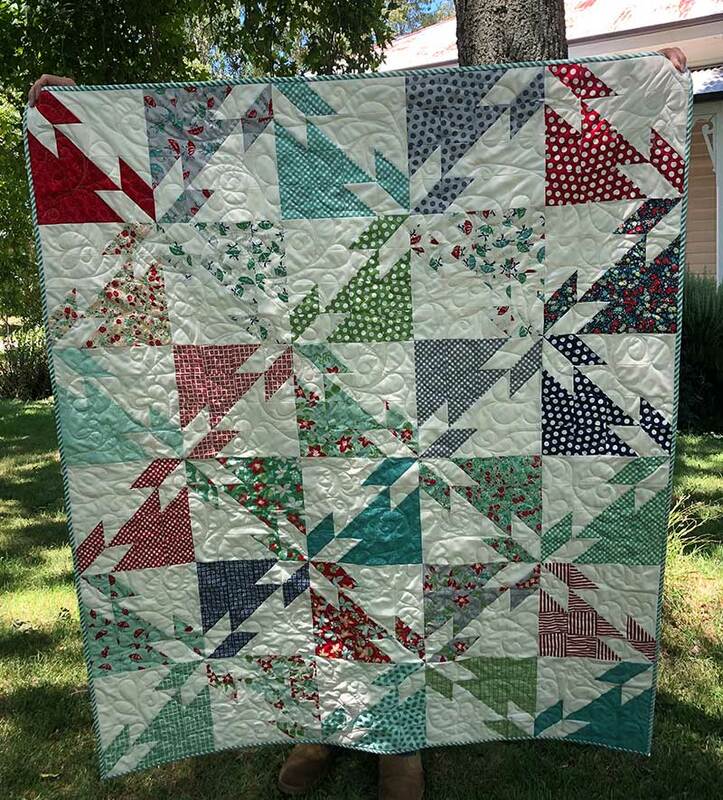 Have you seen the Atomic Starburst Quilt I did with her fabrics? 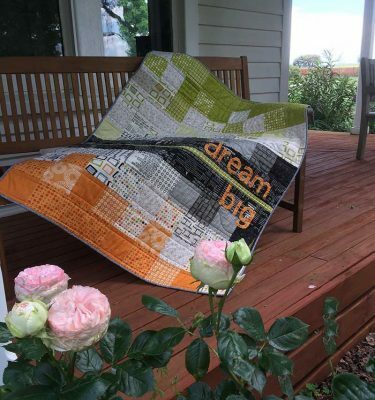 https://saidwithlove.com.au/atomic-starburst-quilt-finish/ Just my most favourite quilt ever!! Anything you make with her fabrics will look amazing!!! Thanks Anne – it was such fun to make! I love the fabrics in your quilt. Especially, the umbrella fabric. I might have to get some. This must be the year of using your stash everywhere. 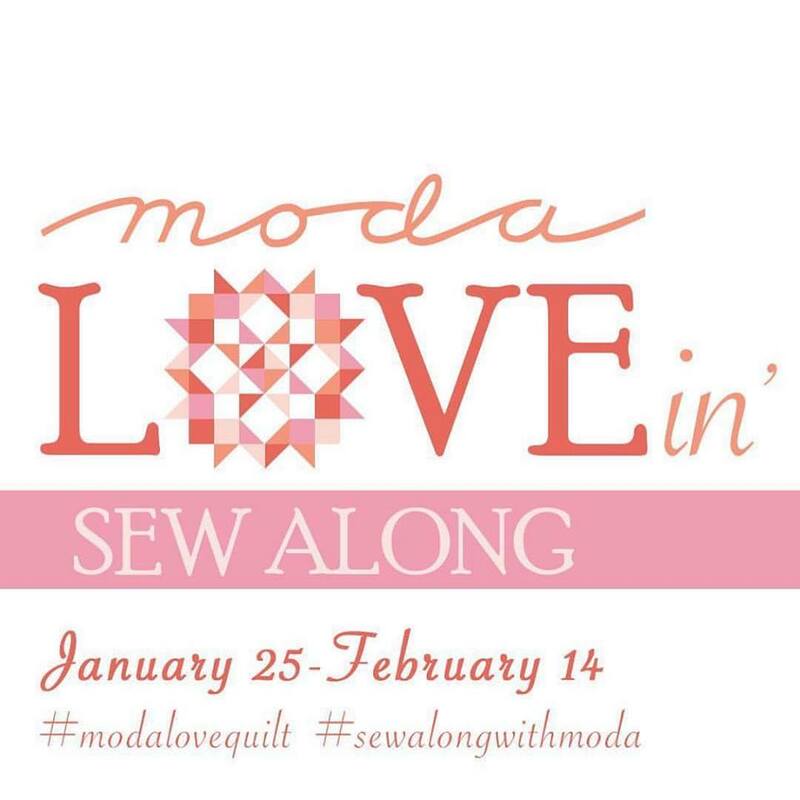 It’s the theme for our quilt guild this year. I don’t have a particular fabric in my stash to use up this year. It’s just a year of shop my stash first before buying fabric for a new project. Sadly the umbrella fabric is pretty hard to find these days (April Showers came out in 2013) but shopping your stash means you can find / unearth some beautiful treasures that you have forgotten about! So many wonderful quilts to be made! This is such a fun look!! I am hoarding my solid color block precuts. I love the secondary patter of the stars. This pattern would look fantastic in solids!! I’ve been collection France/Paris, France themed fabrics for a couple years and now have a healthy stash full of them. The size of the blocks and pieces for this pattern will make it very easy to display the larger prints I have. This is definitely a win! How wonderful! They will make a wonderful quilt! You could even make your blocks a little bigger to make sure you see ALL the print! I love this quilt and I’m definitely adding this one to my list. This is a quilt I could use one of those hard to cut into fabric “coz they’re too pretty” packs!! Hehe…. don’t we all have a few of those sitting around! Definitely crack them open and use them….. the fabric always looks even BETTER make up into a quilt! This is a beautiful rendition of this pattern! I have been “hoarding” beautiful rainbow batiks.. perhaps they would be good for a go at this pattern…? Ooohhh…. nothing like a good rainbow!! I have finally used a beautiful jelly roll..(so hard to unroll those lovely things!!) for a Judy Neimeyer quilt! Your quilt turned out great! Thanks for sharing. Hehe…. I too have a hard time opening up a jelly roll…..they are just soooo pretty! 😀 Yours will look fabulous I am sure! I have been collecting a lot of low volume FQs I hope to use as background for an applique quilt. I love scrappy low volume backgrounds for a quilt! Enjoy it! I have some Liberty squares calling me. Love the Hunter’s Star. Your Rose Garden Star Quilt is gorgeous. 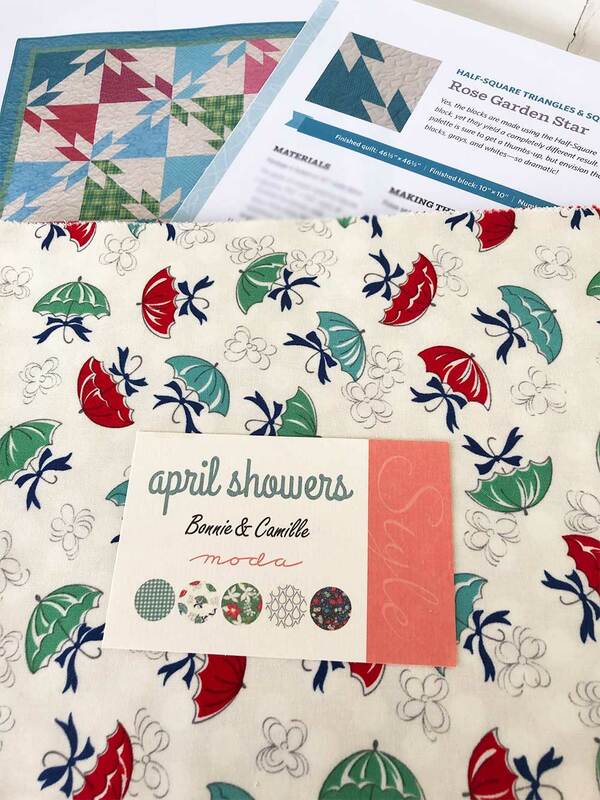 The April Showers fabric just makes me sing! Last year I found and fell in love with the Villa Romana line for Robert Kaufman and had to sneak some in to my stash. I think this just might be the pattern that it has to come out of hiding for! I’ve been following Teresa for a few years and did test one of her patterns. She has me hooked on her make and cut ideas! That sounds wonderful Carol! Teresa has done a wonderful job with her book and all her patterns! Enjoy making with your Villa Romana! I have been enjoying going through my stash and finding some ‘oldies but goodies’ in there! Have fun sewing up yours! I have some Kaffee Fasset and some Anna Maria Horner fabrics that I have been saving for several years (read 8-10). I think this is the year! Hehehe….. yes, I think after that long they deserve some time in the spotlight! I have fabric that was my mother’s from back in the fifties. One of these days I will use it. Oh how wonderful! That would be very hard to cut into ! I love this quilt! I have sooo much stash I can’t pick a favorite. This year I am finishing really old UFO projects, next year I will use some of that stash. Good on you for finishing up the UFOs! It is so satisfying to get them finished! I have some Dutch chintz that I bought in Amsterdam. I need a special project. Oooh…. that will look awesome in a project. One day the right project will come along and you will just know! I have a Christmas layer cake from Me and My Sister that I have been looking to use with a great pattern. This looks like one! All of my fabric is hoarded and needs to be used up! 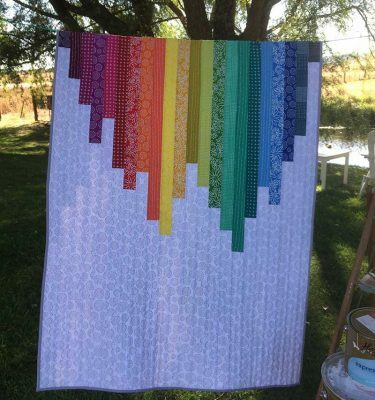 I was scrolling through blogs and came across yours with this lovely quilt. I love that you used a layer cake. So very pretty! Thanks Gina, I always look for ways to use up my pre-cut stash! I have some Art Gallery fabrics from Sharon Holland that would look lovely using this pattern. Thanks for sharing your quilt and the giveaway. I have some Alison Glass that I’ve been hoarding and adding to and this year I’m going to use it! Definitely do! Alison Glass fabrics look amazing in pretty much everything I have ever seen them in! Quilts, bags, everything! My fabric stash includes an incredible amount of Kansas Troubles fabrics, some from years past that aren’t available anymore. Guess I should use some up! Hehe…. 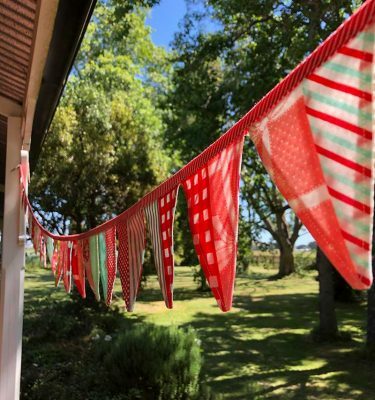 I do encourage you to use up lovely fabrics… whilst they are lovely to look at and pat occasionally, they are even better made into a project that can be used and loved by more than just ourselves! Great quilt! I have been hoarding some french fabrics that I bought two years ago – they are a layer cakeof reds and beiges that would make a great quilt! They sound lovely Ali! I did one a while ago with a layer cake of Midwinter Reds and it looked wonderful! https://saidwithlove.com.au/wrapped-in-love/ You just can’t beat red in quilts!